My walking foot woes on the Juki were solved with a trip to the Montavilla Sewing store in Portland where I bought it. It turned out that the lever on the walking foot that fits over the screw (that also serves to keep needles in) was slipping sideways and catching in a groove. It had completely bent a pretty sturdy screw and even ground off a bit of the lever metal. The repair guy ultimately solved it by adding a washer so it can’t slip into the groove anymore. He also smoothed out the metal on the lever so it rides without catching again. It works perfectly. Yay! If you look closely, you can see the new little washer that solved all my walking foot troubles. Though it seems I’ll be making a second trip there soon because all the fiddling has knocked the needle threaded out of whack and it doesn’t work now. But that wasn’t something that prevented a finish. The center I quilted in a grid pattern on the gray sashing. It made a great diamond pattern on the back. 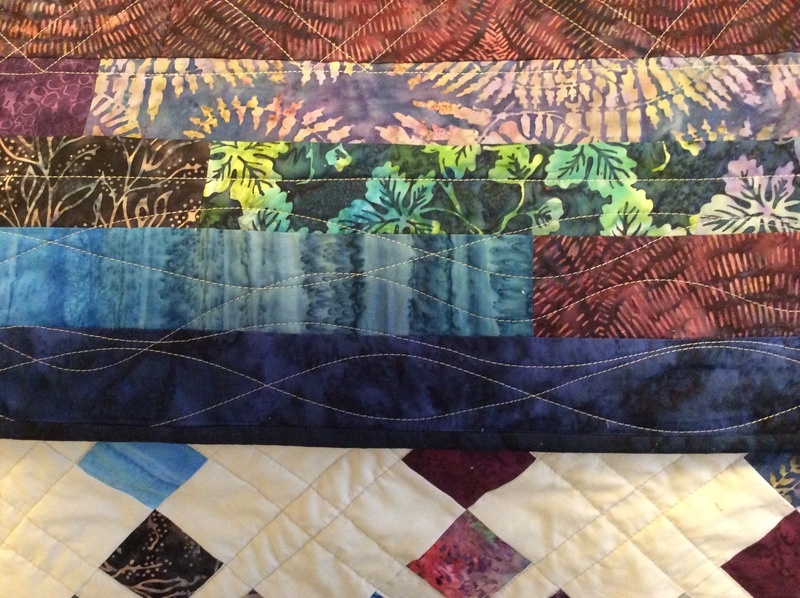 The narrow border I stitched on just the edges, and then I added some wavy lines to the wide border – really fun to sew and they make a good contrast with all the straight lines throughout the main section. The binding went on quickly. I almost always do a hand sewn finish on my binding, but my cousin has a dog and I think it might get washed a lot, so I did a machine sewn finish for extra longevity. I sewed it on the back first, ironed, and then sewed down the very edge of the front. 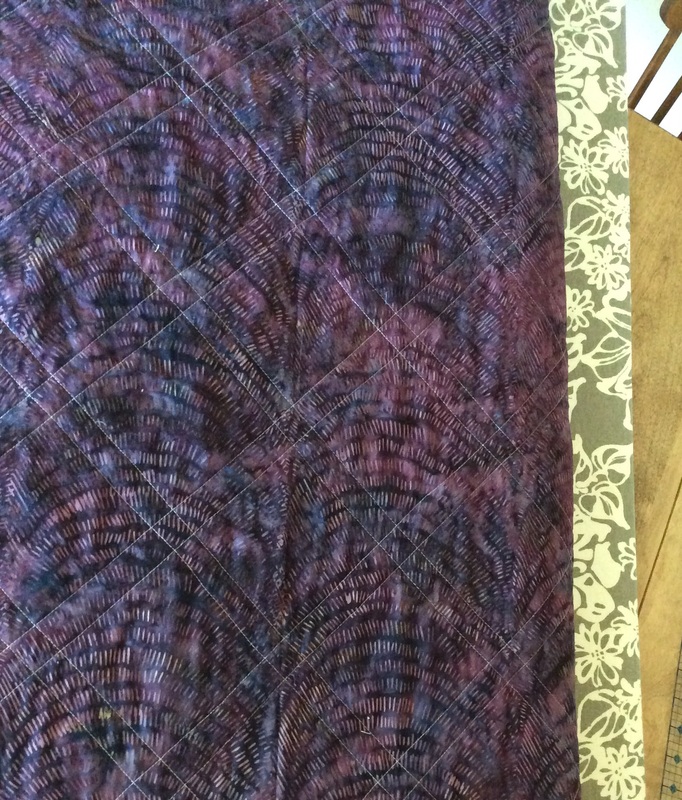 I used the same fabric that made up the thin border for the binding, so it frames the wider purple border. My cousin came down to Portland last weekend just in time to bring it to me. 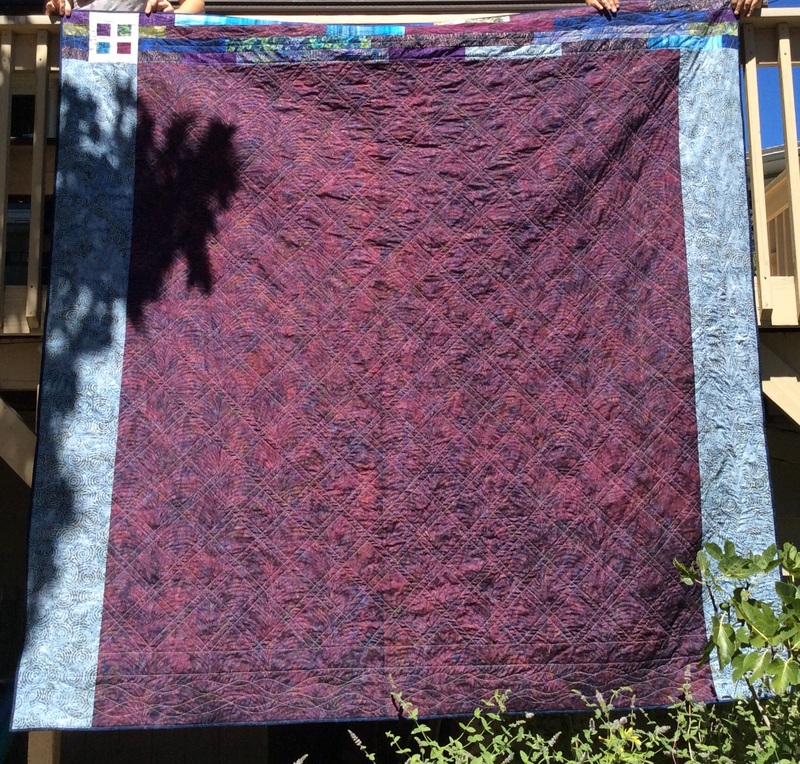 I love how it turned out, and I’m no longer afraid to make such a large quilt. My Juki’s harp handled it without much trouble – having the blocked on point helped with that I think, since I could pull the corners out of the way through the harp space. A new quilt four our queen sized bad may be in the near future. Next up is a duvet cover for my mom, a much quicker project. Though it did take her an hour and a half in the store to pick the fabric. She and I have a lot in common – we must touch all the pretty colors! 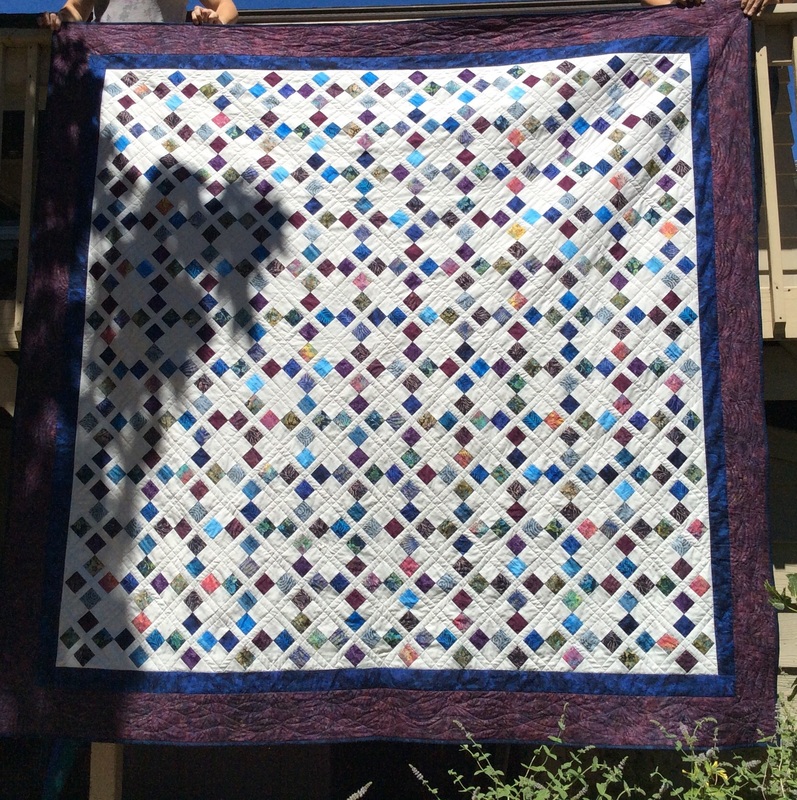 Posted on August 7, 2015 September 30, 2015 Categories QuiltsTags Juki, Moroccan Tiles, walking footLeave a comment on A finish! It has been rather a fortunately/unfortunately story around here in the crafting arena. 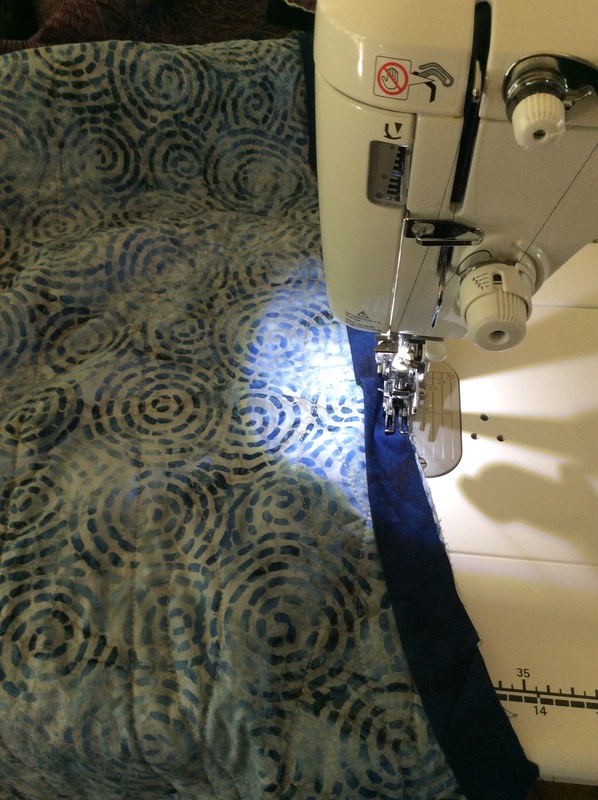 I jumped right into quilting yesterday morning, after moving to the dining room where the table can be made significantly bigger than my sewing room can handle. 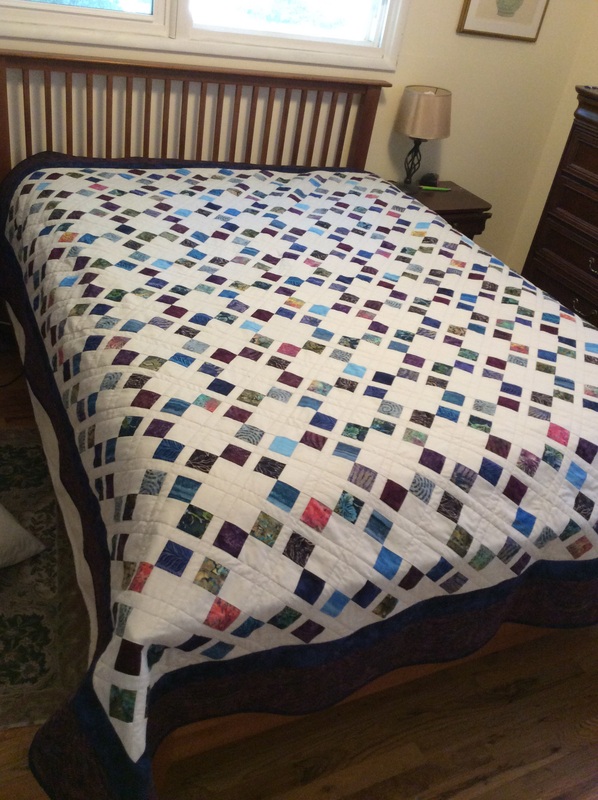 I need to do quilting in the morning when it is cooler. Fortunately, I had a lot of empty bobbins to fill. Unfortunately, I filled five of them with navy blue before I tested it on a scrap sandwich. The plan was gray thread for the top, navy for the back. Defintely not a success. The loops of the navy show – not a lot, but definitely not something I wanted for the front, which is going to be quilted entirely in the pale gray areas. Fortunately, I had more empty bobbins to fill with gray. Unfortunately, there were only two. But I didn’t want to waste all that navy thread by pulling it off, so the plan is to just refill the two until I get to a store to buy more. 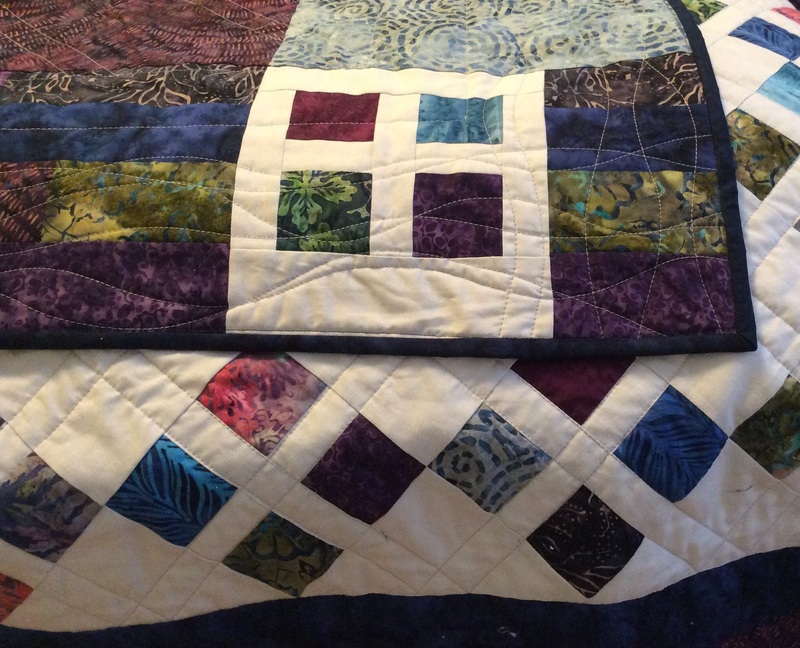 Once I started quilting, things were going smoothly. I was able to wrestle the whole thing well enough through the Juki’s harp (fortunately). Unfortunately, just as I was changing out the second bobbin, I realized I’d never put on my walking foot! I think all this heat has melted my brain. 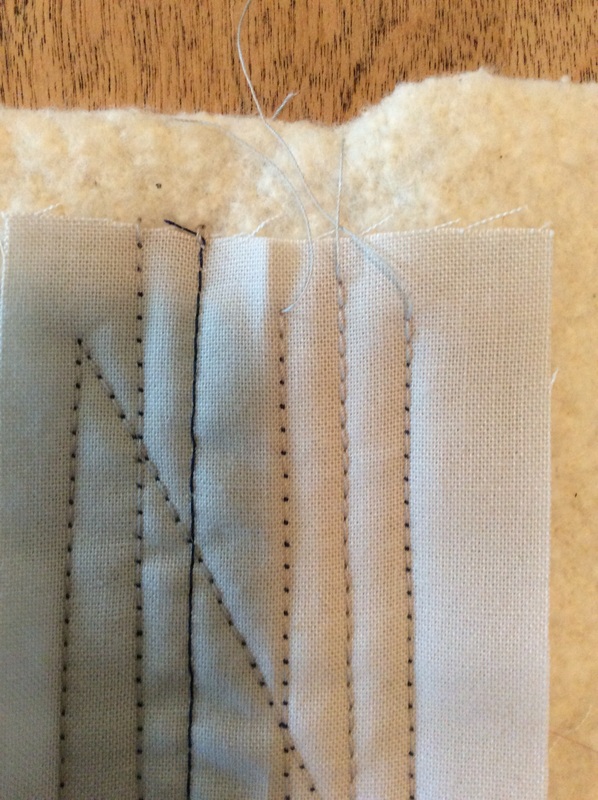 Quilting with the regular presser foot. That was pretty much the end of the fortunately part of the quilting. I had nothing but woe once I put on the walking foot. 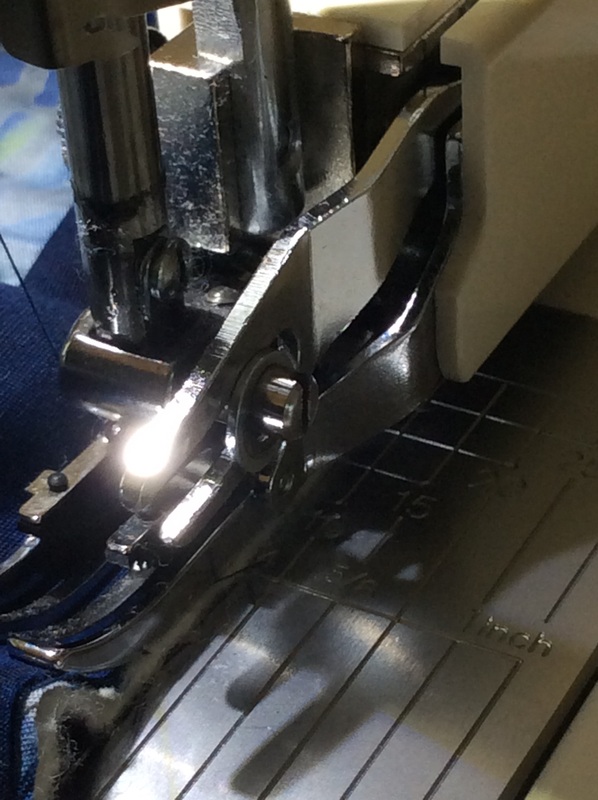 It would stitch along for a while, then suddenly seize up, forcing me to clip the threads again and again to get the machine to function. It was as if the needle was getting caught on something. I checked the bobbins, changed needles, did a thorough cleaning of everywhere in the bobbin casing – same problem kept happening. It seems to be the walking foot is wrenching the whole bar that the needle is in to the side somehow, twisting it. The screw that tighten the needle and the part of the walking foot that rests around is now out of perpendicular, so the walking foot eventually prevents it from moving up and down smoothly. 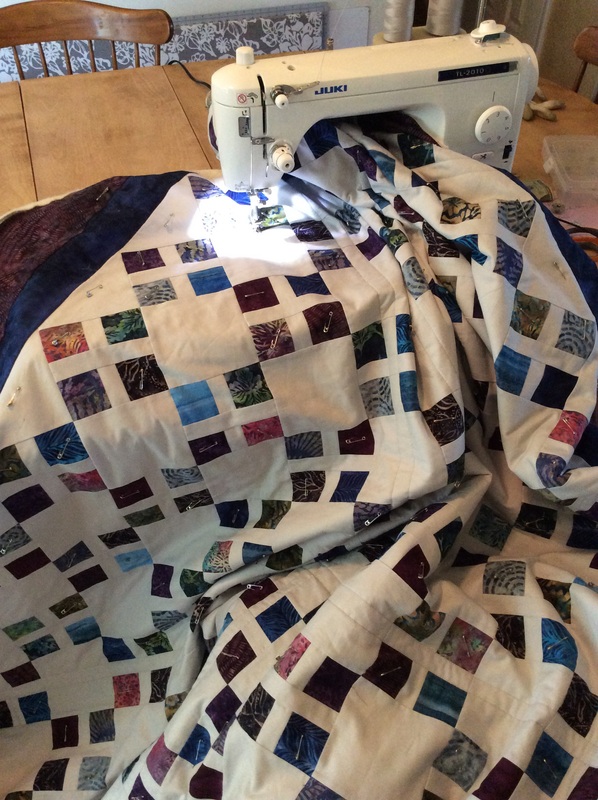 So, unfortunately, no more quilting with the walking foot until I get the machine into the shop on Monday and find out why this keeps happening. Back to a more fortunate note, there is no end of fiber crafts to switch to around here. 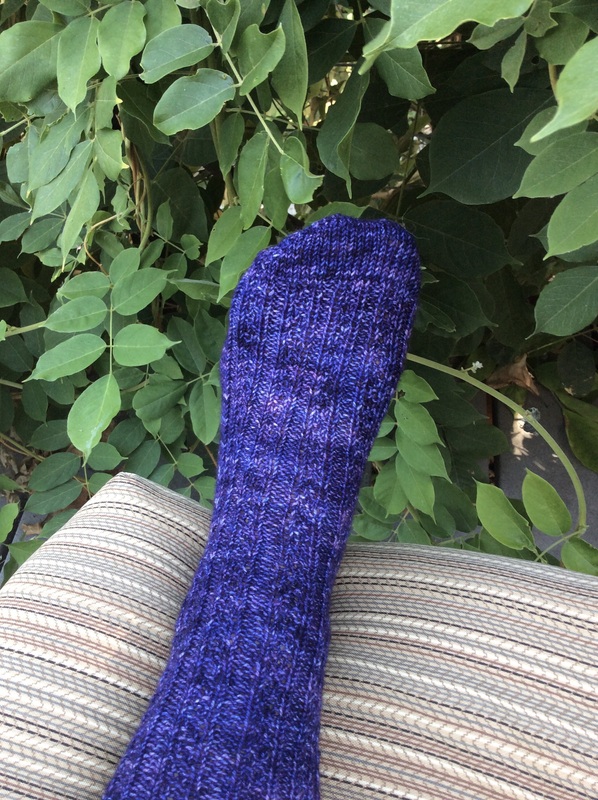 Today I finished a sock. It fits perfectly, and I’ll be casting on shortly for sock two. 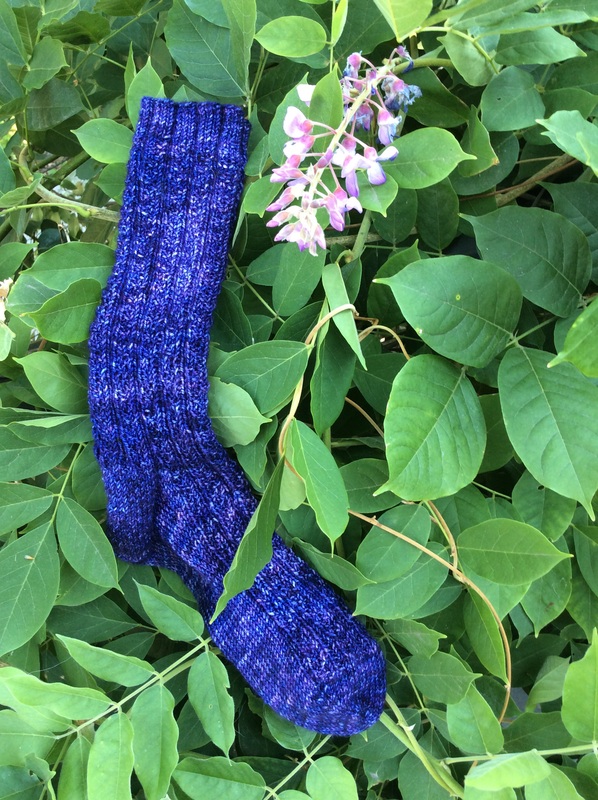 Much more of a deep purple than it appears in the pics – I dyed the yarn a while back and started the sock on our June trip to NYC. It has been languishing since the yarn color and stitch pattern make it hard to see in the evening, which is my usual knitting time. But fortunately (last time, I promise) I was spending a sunny morning with friends and had lots of light.